Purobio Vegan Eyeliner & Fard Duo is a 2 in 1 makeup for your eyes! Soft and creamy texture, the eyeshadow illuminates the eyelid, while the kajal pencil intensifies the eye contour of your look. Its formula is rich in organic natural oils and vitamins of sweet almond, sesame, soy oil and apricot nourishes your eyelids. 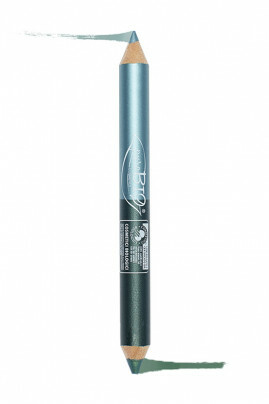 The pencil format of the Purobio Organic Jumbo Duo for Eyes is easy to apply! PUROBIO Eyeliner & Eyeliner Pencil 2 in 1 to illuminate your eyes! Start by applying the eyeshadow on the entire eyelid. With your fingers, soften the edges to blend the colour to the skin. Draw the outline of your eyes with the liner pencil on the upper and lower eyelids. A nickel-free composition in the PUROBIO Organic Eye Pencil! INCI Turquoise Kajal: OCTYLDODODECYL STEAROYL STEAROYL STEARATE, MICA, C10-18 TRIGLYCERIDES, OLUS OIL (VEGETABLE OIL), PRUNUS AMYGDALUS DULCIS (SWEET ALMOND) OIL*, HYDROGENATED VEGETABLE OIL, COPERNICIA CERIFERA (CARNAUBA) WAX*, EUPHORBIA CERIFERA (CANDELILLA) WAX, SESAMUM INDICUM (SESAME) SEED OIL*, TALC, POLYGLYCERYL-3 DIISOSTEARATE, GLYCERYL CAPRYLATE, TOCOPHERYL ACETATE, SORBIC ACID, CI 77891 (TITANIUM DIOXIDE), CI 77007 (ULTRAMARINES), CI 77492 (IRON OXIDES), CI 77510 (FERRIC AMMONIUM FERROCYANIDE). INCI Emerald Green Eyeshadow: OCTYLDODODECYL STEAROYL STEAROYL STEARATE, OLUS OIL (VEGETABLE OIL), C10-18 TRIGLYCERIDES, GLYCINE SOYBEAN OIL*, PRUNUS ARMENIACA (APRICOT) KERNEL OIL*, COPERNICIA CERIFERA (CARNAUBA) WAX*, MICA, HYDROGENATED VEGETABLE OIL, EUPHORBIA CERIFERA (CANDELILLA) WAX, TALC, SILICA, POLYGLYCERYL-3 DIISOSTEARATE, GLYCERYL CAPRYLATE, TOCOPHERYL ACETATE, SORBIC ACID, CI 77891 (TITANIUM DIOXIDE), CI 77492 (IRON OXIDES), CI 77510 (FERRIC AMMONIUM FERROCYANIDE), CI 77499 (IRON OXIDES).